Sitting precariously cool in front of The National Theatre is the new pop-up performance venue The Shed. The quirky red-squared structure resembles a large-scale shed (of course) and seats just 225 people. 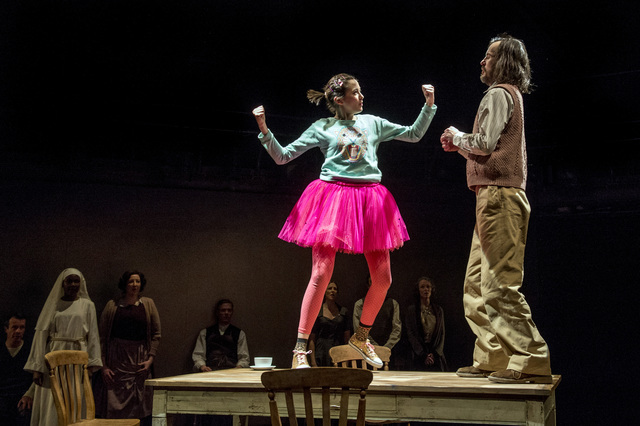 It's an intimate set-up, where the audience lines three sides of the stage in the venue's premiere show, appropriately titled Table. For RADA-trained writer/creator Tanya Ronder, this is not any ‘ole table; it’s a worn, scratched, even sawed, bit of furniture that has experienced 115 years of family life via six generations, each with an abundance of human drama. The story superbly moves from present-day south London to the small cathedral town of Lichfield in the early 20th century, thence Tanganyika, East Africa in the mid 1900s, on to Herefordshire in the 1960s, 70s, 80s, and finally back to present day. The 30 characters, played by just nine actors, equally, and at times confusingly, meander their way through each of the generations, quickly painting a picture of dysfunctional families whose members desperately need one another, but can’t quite figure out how to say it. The writing is sharp and witty: so much so that if you blink your eyes, you might just miss an integral bit of information linking the stories together. Director Rufus Norris, who recently directed British film Broken starring Tim Roth, decides on thematic references such as choir songs and African hymns to help depict place. Descriptive costumes range from sturdily knit peasant-ware to flowery pastels in the form of bell bottoms. And then there is the singular table, which is transformed throughout. All nine actors are forced to change characters and costumes at least twice, this alone giving credence to their fine performances. Furthering this, they must also quickly embody each new character’s inner struggles as the play jumps from multi-racial relationships, infidelity and surrogacy in the snap of one’s fingers. And in each of these families, sometimes one actor may play several roles (for example Paul Hilton portrays free-spirited Jack Holman who impregnates sister Sarah, but also plays their son Gideon Best). If you over-think it, you might lose the plot, so to speak... Instead, if you can sit back and take in the deep family ties, you will find something you can relate to (whether you want to admit it or not). ‘Table’ is an impressive start to the The Shed’s one year line-up. Table is at The Shed through 18 May. Evening shows Tuesday – Sundays 8pm, Matinee shows Wednesday, Saturday and Sundays at 3pm. Running time is 2 hours, 20 minutes with one interval. Tickets £20.00, Restricted view day tickets £12. Book tickets for performances on the 18, 25 April or 9 May and you can combine your visit to The Shed with a pre-show or post-show talk. , 25 April, post-show — talk with the company plus director Rufus Norris, 9 May, post-show — special guests talk tables. Entry for Shed Talks is free with ticket for that night’s performance.